In the last fifty years, many technologies within the information technology realm have matured and have converged. Networks have become pervasive; computers interconnected by networks have become pervasive & inexpensive; processing of data in to information and its presentation has never been easier. We use big words like Big Data, Analytics, Cloud Computing etc. to describe the result of these underlying trends. This evolution of mashed-up foundational technologies as shown here have helped us conduct new activities or improve existing activities, leveraging a virtuous activity cycle of Connect-Collect-Process-Act; we connect everything; we collect data; we process the data; we act based on the information in the data. 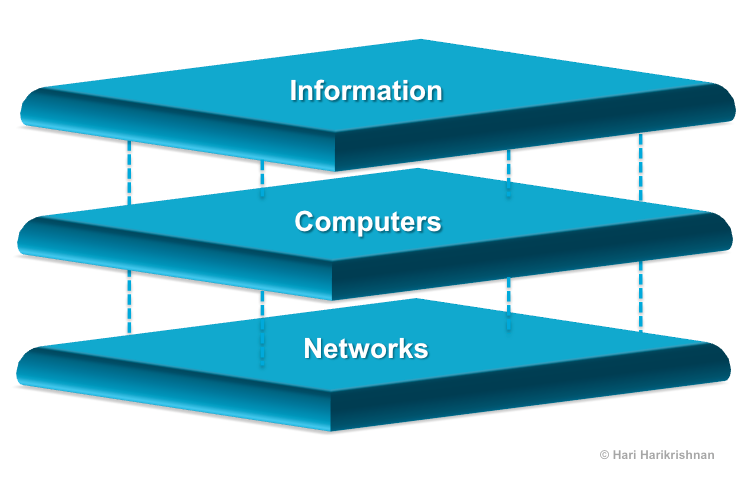 Let’s look at how information technology is morphing business. 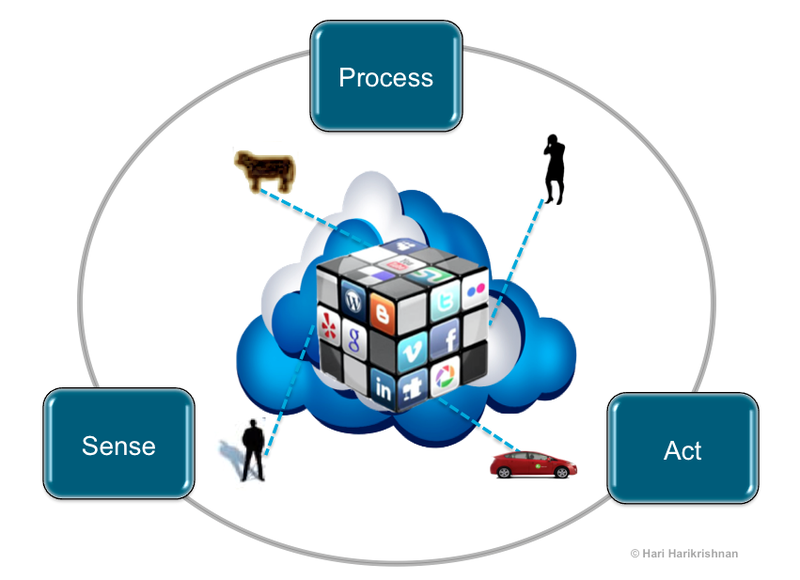 Technology consumption is changing as seen in cloud-enabled consumption. Not only is it changing the business of technology from selling products to selling services, but also any business that uses technology. See this shift depicted in a Product-Service-Business-Technology quadrants (let’s call it PSBT Plane). The bottom half of the PSBT plane shows IT consumption moving from quadrant 3 (technology products) to quadrant 2 (technology services) as we increasingly consume software & hardware as services. A detailed discussion of this can be found in Business Models: Bezos vs. Jobs where we viewed the interplay of Product-Service-Software-Hardware using a similar framework (PSSH Plane). Within quadrant 2, IT services firms are leveraging cloud computing to deliver standardized services (ITO to ITaaS). How business services are delivered and consumed is changing too. This is shown in the top half of the PSBT plane. Decades ago we used to buy computers, phones, and purpose-built business software products to run in-house call centers. Across industries, we outsourced and off-shored many of those self-built business services and business processes to BPO firms. In short, firms moved consumption from quadrant 4 to quadrant 1 above. New class of firms are now delivering entire business processes like payroll, human resources, supply-chain management etc. as services using new technology. 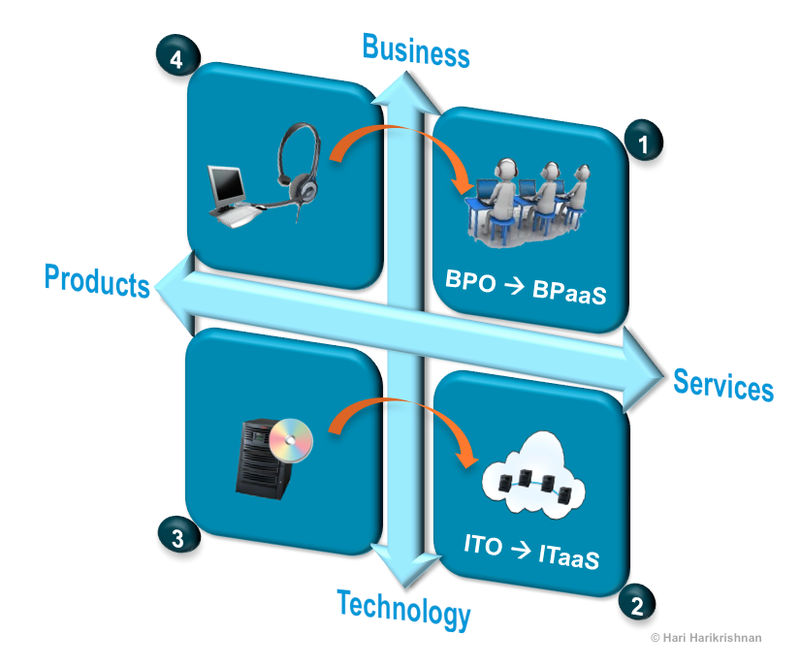 See the transitions of ITO/BPO to ITaaS/BPaaS for a more detailed discussion on these changes. All these changes will make adoption of technology for various purposes and by various industries easy. These consumption shifts should get another push when new lease accounting rules are adopted. This is the juncture where cloud computing meets accounting. More on this later. This widespread propagation and easy adoption of information technology is propelling advances in other technologies and industries. The foundational elements of IT described above can be seen inside advances in genomics (reading & writing DNA), transportation (autonomous vehicles), and manufacturing (3D printing), just to name a few. Along with technology and business, society is changing due to businesses powered by new technology. Social processes are being re-engineered. Hasn’t Evite changed the way we put together social events? The old social network has gone virtual – a virtual social network enabled by new technology infrastructure leveraging an old utility business model as discussed in detail in the Anatomy of the Virtual Social Network. The new generation is going asset-light, as Mary Meeker observes in Kleiner Perkins’ Internet Trends Report; a generation that is consuming virtual assets, not physical assets; one that is consuming services on-demand rather than owning and operating assets. 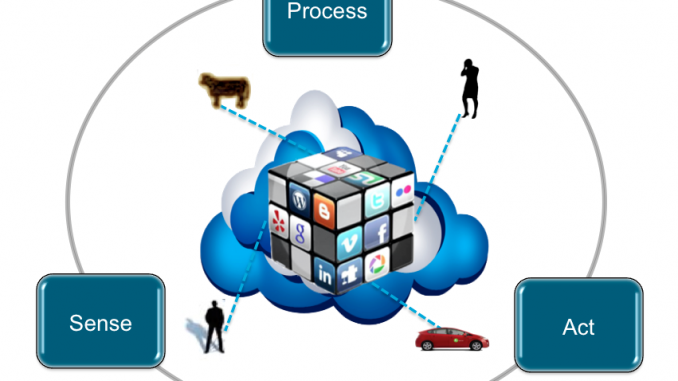 Virtual social networking technologies illustrate how human collaboration is enabled by technology. Collaboration is happening not just between humans, but between humans and any piece of intelligence that we created. 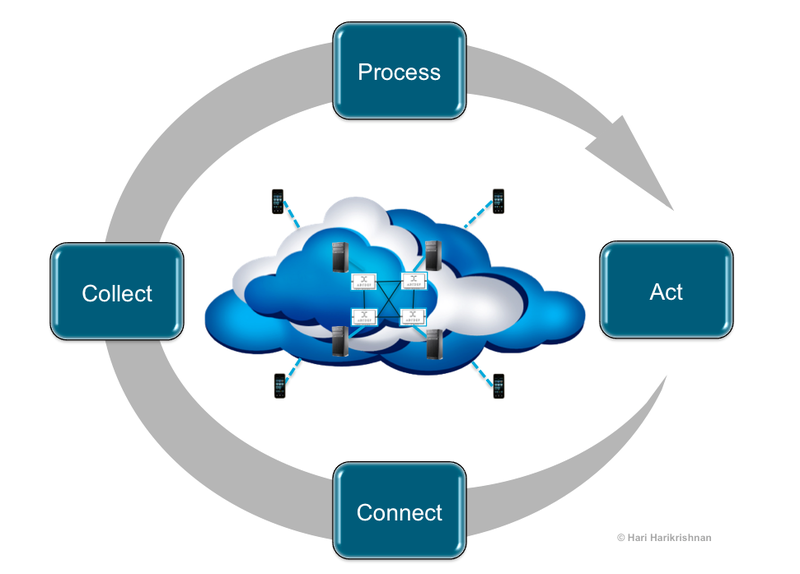 We are starting to refer to this any-to-any communication of connected entities as the Internet of Everything (IoE). More on this interaction between human and non-human entities is discussed in the X2X World. If you combine all the above developments we are left with processes (how we act) that are built on an activity cycle of Sense-Process-Act (SPA). Sensing combines the Connect-Collect steps shown earlier. Each step in SPA is enabled and accelerated by technology. Will we realize new levels of productivity and innovation from this? Will we realize the utopian society that benefits from new ways of collaboration and more efficient utilization of resources? Perhaps. This is the dance of the decade; a dance choreographed by technology. This dance appears to be reaching a crescendo. Before we get too carried away and think that contemporary humans invented this dance, let us pause. Did we just become a technology-enabled society over the last few decades? No. We have been sensing, processing, and acting for a long time. Technologies we take for granted such as speech, reading and writing have been driving human collaboration for ages. Silk road and Roman roads have accelerated collaboration in previous eras. Similar dances were very likely observed by earlier societies that witnessed other technology innovations. They too, in all likelihood, perceived this as an accelerated dance, just as we do now. Is this dance any faster or should we chalk up this perceived acceleration of the dance to a form of parallax (objects closer to us seem to move faster than objects far from us) that causes events closer in time appear to be more accelerated than events farther in time? Whether this dance is new or a rendition of the old, or whether it is faster or not, will contemporary humans benefit from this new choreography? Or will we reenact the wars of prior centuries using our new-found abilities? Will we collaborate or will we conspire using our new gadgets? One remains optimistic that our species is genetically predisposed to sway towards constructive collaboration, not destructive conspiracy. Time will tell.